Here's a project I am currently working on for our Pulp Alley games…. Now that's a tasty burger! I'm not sure whether to make the scenario more Pulp Fiction or more Dirty Harry. Actually, that's a win-win. …or more Dirty Harry -- "Nobody, I mean, nobody, puts ketchup on a hot dog!" Ooo, I'm really liking where this project is going. PS. Someone please tell me that these interior bits are for 15mm. Please. !! Now that's a piece of work! "PS. Someone please tell me that these interior bits are for 15mm. Please." I could, but then I'd be lying to you Dan. 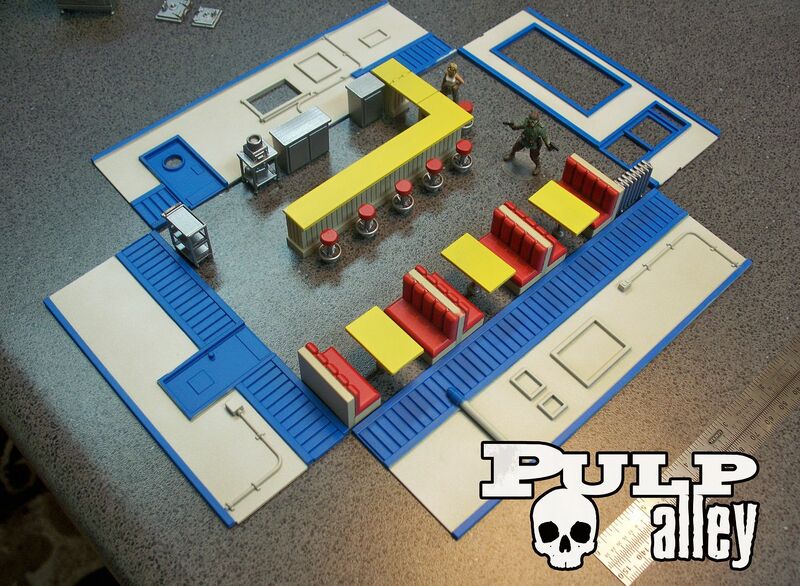 Those are Pulp Alley's 28mm figs. I could really use more 28mm furniture and interiors for my Infinity project myself, these look good. This is really neat. The only thing I can think of to make this more perfect is a fat cook with a hair net over his beard. In a booth: Richie, Potsie, and Ralph. Frankly, it looks more like Bob, Linda, Tina, Gene and Louise would be right at home. With Teddy seated at the counter. I know this is greedy, but is there going to be a kitchen too? So can I order a big kahuna burger? Great stuff, looking forward to the scenario. Dave are you going to make the files available for those of us Pulp Alley players that have 3d printers?